Sure, you know you have a weld to make. . .that’s the easy part. . . but you need to start by examining your application.. Everybody’s job is individual and has specific requirements. Therefore, if you’re really confused the best idea is to consult a welding expert in person. If you still have questions after reading this article, just ask us online. 1.) The joint to be welded is analyzed in terms of its requirements. 2.) The joint requirements are matched with the capabilities of available processes. One or more of the processes are selected for further examination. 3.) A checklist of variables is used to determine the ability of the selected processes(s) to meet the particular application. Step 1 – Analysis of Joint Requirements. 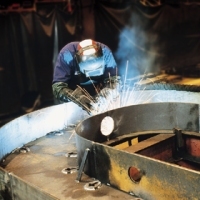 Fast-Fill is required when a large amount of weld metal is needed to fill the joint. A heavy weld bead can only be laid down in minimum arc time with a high deposition rate. 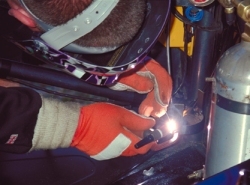 However, Fast-Fill becomes a minor consideration when the weld is small. Fast-Freeze implies that a joint is out-of-position, and therefore requires quick solidification of the molten crater. Not all semiautomatic processes can be used on fast-freeze joints. Fast-Follow suggests that the molten metal follows the arc at rapid travel speed, giving continuous, well-shaped beads, without « skips » or islands. This trait is especially desirable on relatively small single-pass welds, such as those used in joining sheet metal. Penetration varies with the joint. With some joints, penetration must be deep to provide adequate mixing of the weld and base metal and with others it must be limited to prevent burnthrough or cracking. by a combination of these requirements to varying degrees. Once you’ve determined your appropriate joint requirements and ranked them, have your assessment reviewed by an experienced engineer or welder. With time and experience, you’ll be able to make these assessments more accurately and with less difficulty. Your equipment manufacturers’ literature usually will give information on the ability of various processes to fulfill the needs of the joint. (Or, a telephone call or email will bring the needed information.) A wrong answer is virtually impossible at this point, since the deposition rate and arc-speed characteristics of each process can be clearly defined. Since you have characterized your weld joint it is simply a matter of selecting the process that suits your characterization. To view some machines and consumables with various characteristics click here to view Lincoln Electric’s product line. Volume of Production. 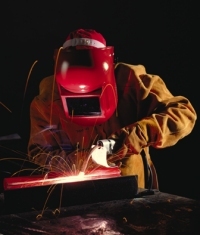 You must justify the cost of welding equipment by the amount of work, or productivity, required. Or, if the work volume for one application is not great enough, another application may be found to help offset the costs. Weld Specifications. Rule out a process if it does not provide the weld properties specified by the code governing the work. Operator Skill. Operators may develop skill with one process more rapidly than another. Will you have to train your operators in a new process? That adds cost! Auxiliary Equipment. Every process has a recommended power source and other items of auxiliary equipment. If a process makes use of existing auxiliary equipment, the initial cost in changing to that process can be substantially reduced. Accessory Equipment. 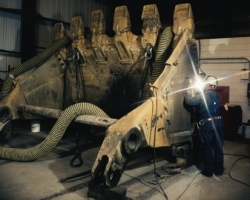 Availability and cost of necessary accessory equipment – chipping hammers, deslagging tools, flux lay-down and pickup equipment, exhaust systems, et cetera – should be taken into account. Base-Metal Conditions. Rust, oil, fit-up of the joint, weldability of the steel, and other conditions must be considered. These factors could limit the usefulness of a particular process. Arc Visibility. Is there a problem following irregular seams? Then open-arc processes are advantageous. On the other hand, if there’s no difficulty in correct placement of the weld bead, there are « operator-comfort » benefits with the submerged-arc process; no head-shield required and heat from the arc is reduced. Fixturing Requirements. A change to a semiautomatic process requires some fixturing if productivity is to be realized. Appraise the equipment to find out if it can adapt to processes. Production Bottlenecks. If the process reduces unit fabrication cost, but creates a production bottleneck, its value is lost. Highly complicated equipment that requires frequent servicing by skilled technicians may slow up your actual production thereby diminishing its value. Human prejudice should not enter the selection process; otherwise objectivity is lost – when all other things are equal, the guiding criterion should be overall cost. Step 4 – Review of the Application by Manufacturer’s Representative. This may seem redundant, but the talents of experts should be utilized. Thus, the checklist to be used is tailored by the user to his individual situation. 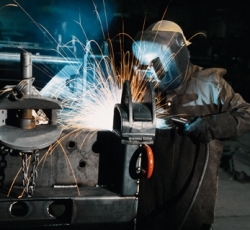 You know your application best and your welding expert knows his equipment best. Together, you should be able to confirm or modify the checklist. To contact a Lincoln Electric welding Expert. Source: Adapted from The Procedure Handbook of Arc Welding. The Lincoln Electric Company, 1994. To order a copy of Lincoln Electric’s Procedure Handbook of Arc Welding or other welding textbooks and educational aids.